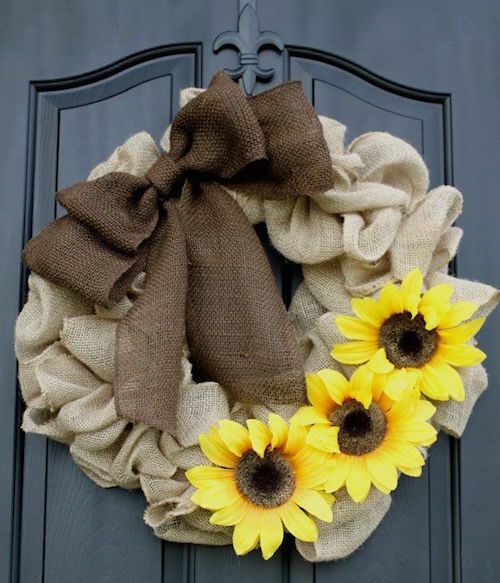 A burlap wreath tutorial is perfect if you want to transform your outdoor home this season. 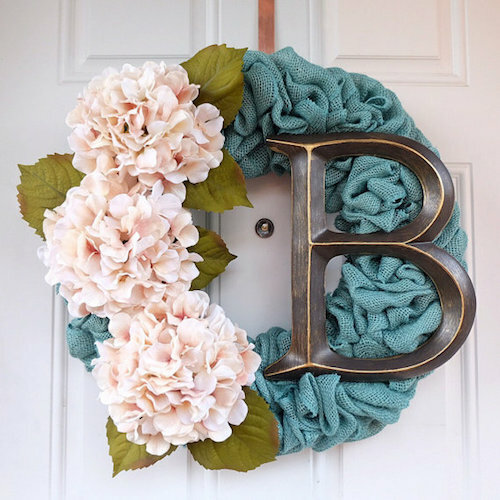 If you love all of the burlap wreaths that you see on Pinterest, in home decor magazines and at your favorite arts and crafts store, but have been afraid to make them, then this quick and easy tutorial is for you! 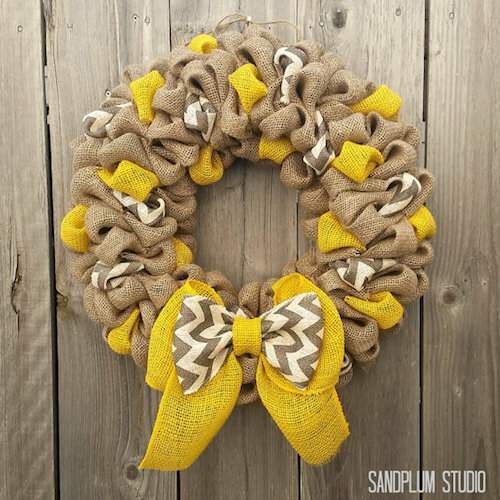 All you will need are some simple materials such as burlap ribbon, a wire wreath frame, and other tools to get started with. 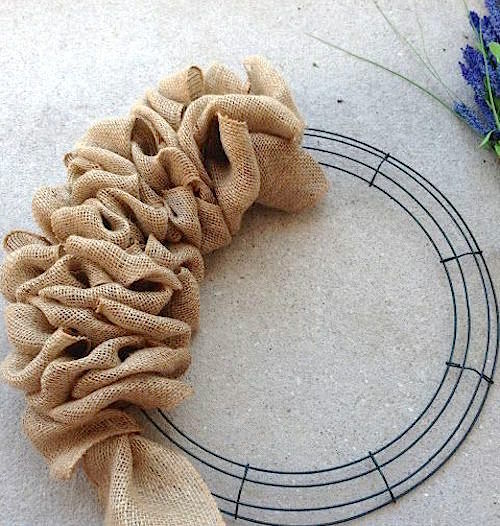 What we love about burlap wreaths are their versatility. They can be rustic and vintage looking or you can make them modern with simple embellishments. Don’t feel like you have to make your burlap wreath look exactly like the ones you see on Pinterest – Burlap Wreaths. 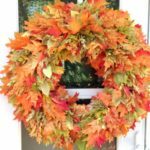 Be creative and start with this one first, then move on to different sized shape wreaths, different ribbon types, and more. Before you get started take a trip to your local arts and crafts store or you can get all of your supplies online. We have created a materials list for you to go from. Feel free to try different types of burlap ribbon. They come in all types of colors, embellished with lace, gold, silver and more. Think of the occasion, setting your wreath will be displayed in. Choose colors that will compliment your front door, your fireplace, or even over a mirror in your bedroom can be gorgeous. Link to burlap wreath tutorial video. 1. Use one end of the burlap ribbon to make a knot around the wire wreath. You can also secure the burlap with a piece of string or pipe cleaner. 3. Continue making loops but make sure that the next “bubble” in the wreath is next to the one you just did. This helps hold the previous loop in place. Keep the loops even in size as you push the burlap through the form. 4. Continue making loops until the wreath is as full as you want. You can make all your “bubbles” the same size or vary the size for a more asymmetrical finished burlap wreath. 5. Cut off the burlap if you have extra. 6. Make another knot to complete the wreath or tuck the end into the bubbles. 7. Use pipe cleaners to keep the burlap in place on the back of the wreath. 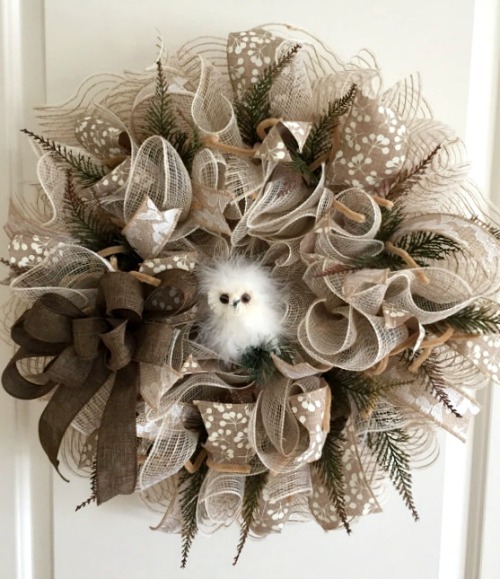 Depending on if you want to embellish your wreath with flowers or bows you can hot glue on your accessories or you can create your own bow from Wired Ribbon, 2-1/2-Inch Natural Color . 1. Hot glue the leaves, flowers, bows, and other ornaments you may have. 2. Watch the wreath video above to learn how to attach the wire ribbon bow. Once you’ve completed your wreath, step back and decide if it’s how you envisioned. If you need to add more embellishments, more colored wire ribbon, or if it looks good for your home. If you have any ideas of how you make your burlap wreaths, we’d love to hear from you in the comments section! 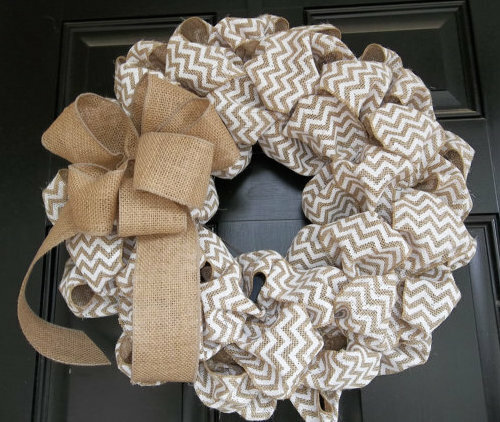 Looking for more Burlap Wreath Ideas? 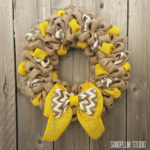 You can make a similar wreath like this, or purchase this one from Sand Plum Studio on Etsy. 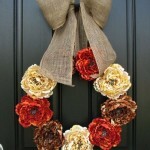 For more burlap wreath ideas, click here. Thanks so much for this step-by-step video. It’s the most helpful one I’ve seen and I’ve referred to it several times to tweak my technique. 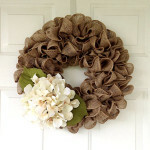 I’m now making burlap wreaths that I, and others, love! You helped me immensely with my new hobby and for that I’m grateful! Best wishes! I loved your video, but I’m confused about the part where you secure the sections with a pipe cleaner. I can’t see from the video if you secure all of the back, or just one or two to a wire. Can you describe in words how you do it? Thank you, and I can’t wait to get started! The videos displayed here are not mine. They are found on YouTube to hopefully assist in making the wreaths. I personally made this burlap wreath on Creative Live here: http://blog.creativelive.com/how-to-make-a-burlap-wreath-a-delightful-diy-gift-idea/ – it should help you with the pipe cleaners. You basically tie them first on one side – then bunch burlap through. Then you will push the ends of the pipe cleaners through to the backside after twisting them. Thank you so much for showing the hard parts in the beginning and the encouragement. People only see the ‘easy highlight reel’ these days and get frustrated when things get hard. Great tutorials with burlap. I love every idea! Thank you, it’s beautiful and looks easy. Question, will the looped through unsecured burlap come off the frame with repeated use of the wreath or does the securing after three rows keep that from happening?